*Data taken from official Zeta Tau Alpha graduation cord provider website on 3/22/2013. School sororities and womens' fraternities are a unique experience that allow women from across the country and the world to connect with each other as sisters. These special societies focus on creating lifelong sisterhood among members, and on encouraging those sisters to be successful in all their life's pursuits. They emphasize important character traits in their members, such as loyalty, responsibility, leadership, commitment, and a desire to serve their community and the world. Of course, paired with these important personal traits, fraternity sisters are also dedicated to academic success and excellence. When your graduate is ready to leave school, you can honor her affiliation with a women's fraternity by giving her teal and white double tied graduation cords to wear around her shoulders at commencement. Teal and white honor cords are the perfect way to celebrate your graduate's experiences with her fraternity sisters. Our teal and white double tied graduation cords are meant to inspire and encourage your graduate to continue in the tradition of honor and excellence that her fraternity has created. The teal and white honor cords symbolize your student's success in her schooling, as well as her friendship and personal ties with her fraternity sisters. By offering her teal and white cords to wear at graduation, you are giving her a small token of her society affiliation that will serve as a lasting reminder of her college or university experiences. Teal and white double-tied cords are used by the women's fraternity Zeta Tau Alpha. 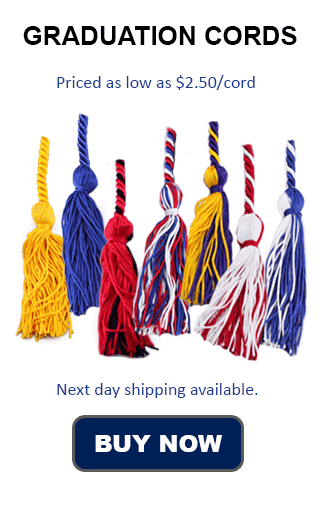 The cords available through their fraternity store, are comparable in quality to the cords offered by HOnors Graduation. However, without our flat rate shipping fee of only $4, and our low prices per cord, you can count on us to get you the cords you need for much less. Include teal and white graduation ropes in your student's commencement ceremony garb, and she will turn heads as she beams with sorority pride at her graduation exercises. Teal and white honor cords are the perfect finishing touch to celebrate an amazing achievement.